Summertime here in Texas is HOT! So I’m always looking for light, comfy, flowy and cool outfits to wear. And the fact that I got all of them under $100 is an added bonus. I’ve said before and I’ll say it again, never underestimate the power of a good sale rack. My shorts I scored on a sale rack at one of my fav local boutiques Abby Gayle’s for $15. These and these are super cute as well and a great price for under $20. My top can be worn in three different ways and believe it or not I found it here at Walmart for less than $12. You can see in the photos I have worn it off the shoulder, one shoulder and regular on both shoulders. People don’t believe me when I tell them I bought this at Walmart, LOL. I have seen the same top in designer brands at much higher prices. I like this one because it is very loose fitting, versatile and keeps me feeling cool and breezy. The shoes I got this spring here and still loving them. Slides are such a hot shoe trend right now!! If you don’t have slides, better go get you a pair!! Last but not least my tassel earrings I got here. Tassel earrings are another big trend right now, this should be a must have on your list. I really love this brand too, they have the cutest most fun earrings ever ! Total outfit cost…$87.49!! (Earrings, shoes, shorts, top). Not too bad huh?? Especially for pieces that are all versatile and can be paired with other things to create a whole new outfit look. 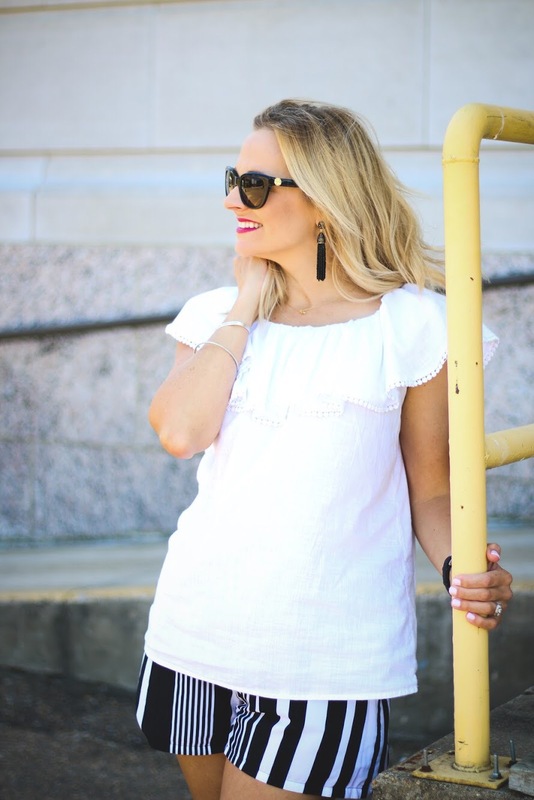 I wore the top with some hot pink dress pants to a bridal shower, (so so cute) I have also worn the shorts with a denim top for another cool breezy look. This is not a sponsored post, all opinions are my own. Please note that some of the links or affiliate links and if you buy from/ click the links I could receive a small commission.